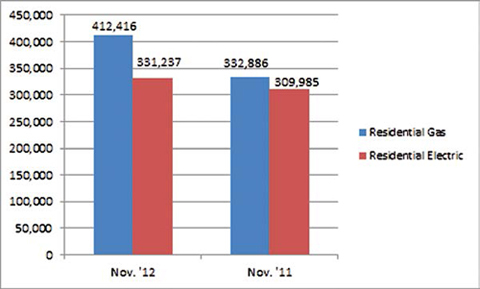 U.S. shipments of residential gas storage water heaters for November 2012 increased 23.9 percent, to 412,416 units, up from 332,886 units shipped in November 2011. 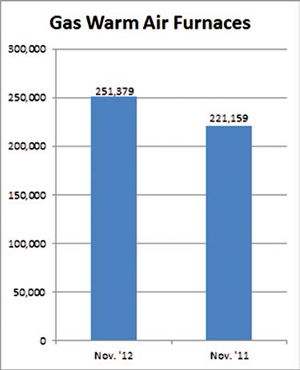 Residential electric storage water heater shipments increased 6.9 percent in November 2012, to 331,237 units, up from 309,985 units shipped in November 2011. For the year-to-date, U.S. shipments of residential gas storage water heaters increased .3 percent, to 3,598,876, compared to 3,589,059 units shipped during the same period in 2011. Residential electric storage water heater shipments increased .5 percent year-to-date, to 3,408,553 units, compared to 3,390,190 units shipped during the same period in 2011. 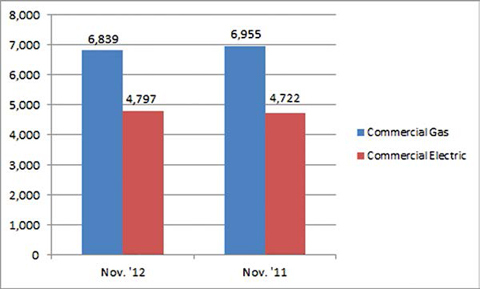 Commercial gas storage water heater shipments decreased 1.7 percent in November 2012, to 6,839 units, down from 6,955 units shipped in November 2011. Commercial electric storage water heater shipments increased 1.6 percent in November 2012, to 4,797 units, up from 4,722 units shipped in November 2011. Year-to-date U.S. shipments of commercial gas storage water heaters decreased .8 percent, to 73,213 units, compared with 73,837 units shipped during the same period in 2011. Year-to-date commercial electric storage water heater shipments increased 13.0 percent to 62,250 units, up from 55,075 units shipped during the same period in 2011. 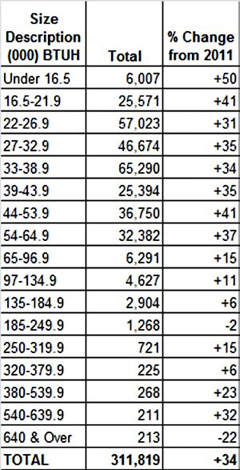 U.S. shipments of gas warm air furnaces for November 2012 increased 13.7 percent, to 251,379 units, up from 221,159 units shipped in November 2011. 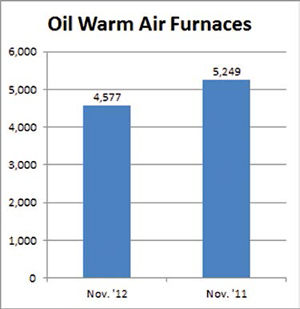 Oil warm air furnace shipments decreased 12.8 percent, to 4,577 units in November 2012, down from 5,249 units shipped in November 2011. Year-to-date U.S. shipments of gas warm air furnaces increased 2.3 percent, to 2,038,643 units, compared with 1,993,386 units shipped during the same period in 2011. Year-to-date U.S. shipments of oil warm air furnaces decreased 26 percent to 32,144, compared with 43,466 units shipped during the same period in 2011. 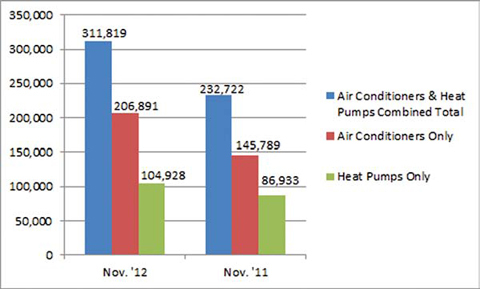 U.S. shipments of central air conditioners and air-source heat pumps totaled 311,819 units in November 2012, up 34 percent from 232,722 units shipped in November 2011. U.S. shipments of air conditioners increased 41.9 percent, to 206,891 units, up from 145,789 units shipped in November 2011. U.S. shipments of air-source heat pumps increased 20.7 percent, to 104,928 units, up from 86,933 units shipped in November 2011. Year-to-date combined shipments of central air conditioners and air-source heat pumps increased 1.8 percent, to 5,330,825 units, up from 5,237,726 units shipped in November 2011. Year-to-date shipments of central air conditioners increased 4.5 percent, to 3,733,546 units, up from 3,571,256 units shipped during the same period in 2011. The year-to-date total for heat pump shipments decreased 4.2 percent, to 1,597,279 units, down from 1,666,470 units shipped during the same period in 2011.